As a conclusion to our series of videos on the song "Carribean Raider" by Grand Baton, Fab Dupont puts on his mastering engineer cap to coax the song towards the final step of the recording process. 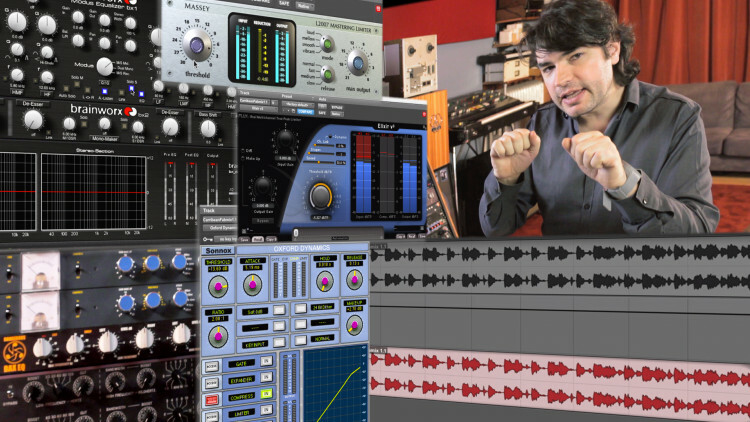 If you've ever wondered what happens when you send a song to mastering, or if you've been willing to do the mastering part yourself, this video gives you the fly on the wall point of view. Fab details his workflow and explains what corrections to make and how to enhance a mix to make it a final distribution ready product. Using a combination of software and hardware (just because he can! 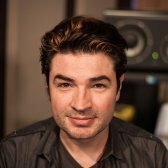 ), he tailors his original mix with Equalization (broad and precise), compression, limiting, MS tooling etc to reach yet another level of sound. Making it loud and competitive though still perfect sounding. Good morning children! Today, we're going to master a song. The song is called "Caribbean." Incidentally, it's the same song that is featured in the video "Mixing Caribbean." We thought it would be valuable for you to see two things. Number 1: what the process of mastering a song can be. There are many ways, but this is one way. Of course, mastering a whole record is different, because you have considerations between different songs. But for now, we can show you what happens when one song is involved. Number 2: we thought you'd be interested to know what happens when the mixing engineer sends the track to the mastering engineer, and what the mastering engineer will do with it. Here we go! Side note: I don't always master my own mixes. I like to rely on a third party opinion for a last check before shrink-wrap, if you will. In this particular case, it seemed a good idea because of timeline, budget, and also because of the tone of the record and the intricacy of it, that I should stay in control. The mix was done a few weeks ago. I have enough distance to call myself a mastering engineer with fresh enough ears. Let me describe the setup. As you can see here, we have a source track, a process track, and a print track. On the print track right now, I have a copy of the mix. That allows me to use my input monitoring trick to always compare what I'm doing with my master to what the mix was. If you want more detail on how this works, this particular setup, there's a video just for that, go watch it. On this particular session, I also have some hardware inserted. The way it works, as you can see here, is that my mix track, the source, is actually routed to Output 1-2 of my converter. Output 1-2 of my converter is routed via my patch bay to input B of my Liaison. There's a bunch of hardware there. That is routed to the input of this Aux track, and this Aux track, which I'll use for process, is routed to the input of my print track. the source track is gonna play, go out to the converters, hit the Liaison, go through the hardware, go out of the Liaison, go into the UA 2192, go into this Aux track, through whatever plug-ins I have here, and the output of that Aux track will get recorded to this track in real time. Of course, you don't have to use hardware, I like to do so, I happen to own it, I use it. First, let's listen to the mix. Ok, I get the vibe for it. There's a little bit of bunchiness when the 2nd part comes in. We could open up a little bit on top. I think it's a great mix, we won't have to do much. That's also part of the choice. Maybe some tracks are gonna come to you for mastering where you don't need to do much. The skill in those tracks is to forget about the ego, and make sure that the music speaks. Don't do something because you've been hired to do something. Maybe somebody has hired you to do nothing, just to tell them: This is great! Change nothing. In this particular case, I think it's great, but a couple of things could be better. Side note: if you remember, I told you I copied my mix to the ref track here, the print track, so I can do my input monitoring trick. Well that's great, because now we can listen to what going out a D/A, into the Liaison, out of the Liaison, into the 2192, back into Pro Tools will do to the sound. If I click here, when it's green, I'm listening to the full round trip. When it's grey, I'm listening to the actual mix on that track. I can compare the two. Let's check this out. I'll start with the mix. What I hear is that the round trip is a little thicker, and a little mellower, probably because of the tone of the 2192. So already, just the round trip is considered processing if you will. I don't think it matters much, because of what we're gonna do next, but still, it's a consideration. The first thing I'd like to do, in this particular case, because of the style of the music, I know the client is gonna want it pretty loud. Now this guy happens to be very smart, so he doesn't want it crushed. So we want it loud, and not crushed. That's the tough part. Usually, it's a good idea to prep your mix by limiting a little bit. At least, it's a good idea for me. So I would limit the source track. Obviously, I mixed the track, so I know what I had on the 2-Mix. I already had a little compression, and no limiting. So I can afford to have a little bit of limiting on here. I'm gonna use the Elixir here, and the principle here is I'm just gonna tap the transients a little bit, to start prepping, kind of like reducing the dynamic range of my track, right from the beginning, which will give me a little more headroom to process after, and then I'll make up the gain later. When I mixed this, I left some headroom in there. 4, or 5, depending on how excited I was that day. Check it out. What's happening here is I'm shaving .8, .9 dB, just peaks, from the overall program material. If we compare... This is what we have now. That's it! Just a little bit of a tiny corset, not very tight. I'm not gonna make up the gain, because I want to keep that headroom for the rest of the process. Next, I'm gonna try a little bit of compression. If I use a slow attack and a medium release, I'll be able to compress a little bit, it won't touch the transient. This actually might add some punch, or at least the impression of punch. And because I'm compressing a little bit, I can raise the level a little bit and that will raise the low levels of the track, whatever low levels are in this track. So let's check this out. Let's compare with and without. This is where we started. Listen to the center, and the punch of the bass drum, and drums in general, in the middle. I'll do it again. Listen to the punch of the bass drum, and also the... (sings), whatever those things are, synths, or guitars, it's hard to say. Listen also to the presence of the reverb. Check it out. Without. What's going on, since I'm compressing and raising the level, all the low levels are coming up, you hear more reverb. Maybe a bit much. So I'm gonna back off a little bit. Now, for you to be able to hear it on and off at the same level, I raise the make-up gain. I don't want to do that, because I want to keep that headroom, like I did for the Elixir, for my hardware. But! What I'm gonna do now is I'm gonna pick my final limiter, and I know from experience that this Massey limiter is great for this kind of stuff. I'm gonna look for my final level here. I like that. You noticed, I raised the gain, it got louder, and then I listened to the different colors that are available on this limiter, while I was compressing the track. put the track at the level it's gonna be at the end, or more or less, and then listen to the different colors. Which is why I'm using the limiting now, so that I can hear what the limiter will do pushing back against the changes I'm gonna do in hardware, or in software here. Does that make sense? Think about it! If I'm gonna EQ my track, add a lot of bass, and then try and limit it, basically, everything I've done here will get destroyed by the limiter. But if I have the limiter on right now, on stun, and I listen to that, while I EQ, I can hear what the limiter will do to my EQ'ing tricks. Of course, now, we have a problem. You can no longer tell what's going on. So in this particular configuration, the trick is you take the output of this track, temporarily, until you're gonna print it, and you try and match your level with the level of the mix. It works! Some of you may wonder why I did not lower the output of the limiter instead of lowering the fader. This is why. Can you tell what the output of the limiter is right now? No you can't! But you can see that your fader is down, so when it's time to print, at least you'll know that you're 6 or 7 dBs down because it's screaming at you. Consequently, you won't forget to bring it back up before printing. Next, let's shape the tone of the track a little bit. It's pretty dense. But I can tell that it would be nice if it was a little thicker. Kind of a transformer kind of tone. And I just so happen to have a pair of those in there, so let's try that! I have this Neumann EQ. Right now, it's flat. Let's listen to the track with and without the Neumann EQ, flat. There's a certain kind of like matter that gets added through the transformers. The EQ is flat. I'm not making anything brighter or darker, I'm just changing the tone, shaping the transients, so that's it's a little thicker. I'll play it again twice. Listen to the bounciness and the elasticity of the track, and listen to the thickness. Don't think frequencies, think texture. Check it out. I like it. This is now a good spot I can start from to fix stuff that bothers me. The first thing I'm gonna do is high-pass and low-pass the track. Why? Because I don't need everything there. I don't need 20Hz, I don't need 30Hz, I don't think so, we'll figure it out, I definitely don't need 30k. I'm not gonna feed my converter stuff that I don't need. It's gonna work less hard, it'll be more focused. To do that, I'm gonna use the Bax EQ. I'm gonna turn it on. And then I'm gonna start playing with the high-pass. Here we go. It's a little cleaner with, right? Listen to the very bottom of the bass drum and its resonance. A tiny bit of a mask goes away. Just because I'm high-passing the bottom, the mask goes away. Check it out. Very nice. Let's move on to the low-pass. It's gonna get rid of all that supersonic stuff that only your dog and your toddler can hear, and you don't care about, neither does your converter. I'll start with Out, and then I'll go to 70k, that's 70 000 Hz, and then 28... 18... until I hear something, and I'll go back up. 18, I definitely hear it acting. I don't like it. Check it out. This is without, at 18k. It's duller! Let's go back up to 28. It does a smidgeon of something, but I kind of dig it, it softens it. It makes it a little smoother. I'm gonna try this. I may change my mind. I feel I need something in the middle different than what I need on the sides. So I'm gonna use an EQ. Here I'm gonna use it in the box. It allows me to work in M/S mode. Let me show you. This is just the center. And this is just the sides. For the theory on how this works, refer to the Mastering Tools video. Right now we're just gonna use it. So I want to check out my sides. That "Krrr! Krrr!" is a little annoying to me. That! So I'm gonna lower that. And I'm also gonna high-pass a little bit, as you saw. High-passing the sides gets rid of information that I don't need, unless the basses are on the sides, but in this case they are not, and allows me to get more energy out of the sides without losing too much important information, which is very nice if you're trying to make a loud record without crushing it. We started here, on the sides only. I was a little brutal on the high-pass. I like this, this is cool. Let's listen to the center. There's a little bunch there, let's get rid of it. Very nice! And... What else? Maybe a little bit of a opening in the center. Check it out. Check it out. Especially on this part... (sings the part) Listen to... (sings the part) There's a little bit of a mask before this correction, and then the mask is gone. I'll play it again. Without. I went too far on the center. Gain... Maybe .5 dB will do. The beauty of working in M/S with the Brainworx, or any other M/S EQ, is that you can pinpoint one problem on the center channel, and smooth out the whole track and get rid of all the mask, or most of the mask, by just that one EQ move, of like 1, 1.5 dB, maybe 1.8 dBs. That's magical. Otherwise, I would have had to compress, or multiband compress, and compression is often the enemy in this particular case. That said, I hear... A/B'ing, that I lost a little bit of the "Mrrr! ", the bottom, like that bouncy bottom thing. so I'd like to put that back in. I'm gonna try and do it in the center channel, on the bass drum, at the very, very bottom. Check it out. It's a little more "Rrrr! ", a little more animalistic that way, I like it. Now I feel that the very bottom and the upper low-mids if you will are a little disconnected. Check it out. Compared to the mix for example. This is the mix. It's nice and full, but it's a little angular. This is where we are right now. It's a lot cleaner, but it's not as fat. go back to hardware and try and add a little bit of that "Mmm" at the bottom using one of the EQs. Let's try that. Let's try the famous Bax EQ around 84 Hz. And this is with a little bit of 84. One dB. We're getting back to the original problem. It's clouding a little bit. It's just 1 dB at 84. But it's a Bax EQ, which means it's a really broad line. So maybe I should hit lower, so that my correction starts lower and gently links with the upper range. Let's try that. 1 dB at 74. 1 dB at 74, again. No, it's not working. So... let's try the Manley. Let's try a little bit of the Boost at the bottom of the Manley, around 60. I dig that! Check it out. Without. Hear how the bottom drops from here, in that little cloud here, and just goes down, and the cloud goes away. I cleaned up the track, as I went along, did some transient control on everything, then I got a nice, even, pleasing tone, but I was lacking a little bit of the extension in the... for lack of a better word... cojones! Then, to put that back in, I tried the Bax at 84 Hz. It did add some cojones, but then it made a cloud again, which is what I've been working at erasing for the last X minutes. So then I tried 74, and that didn't work either. There was some pleasing sides to it, but some unpleasant sides to it. So I moved to a different EQ. If the tone of a particular EQ doesn't work for this particular track, it's okay, try another one. So I turned the Manley on, and I tried at 60, and it did what I wanted to do, which is link the bass drum to the rest of the bottom without any kind of like seizure, or any link that I could hear. That was the thought process behind what just happened. So now, I think I can consider myself happy with this. I have to make sure that the overall level of the track is in line with today's standards, the artist's desires, what the artist needs, what the artist thinks he needs, and then what I want it to sound like, since I'm responsible, and my name is on the record. So, I'll bring the fader back up, look at my hardware meter, and see where it sits. It's loud! -6, -5 RMS. But it's not crushed! Which is what we wanted. Really smart and elegant solution to treat the mix with limiting/compressing first, place the final limiter last of the chain and then insert the outboard. Do you often use EQ as a first in the chain, Fab? Thank you! another great video FAB! thanks! @heli667: I master the song at whatever sample rate is comes in at. Most often 44K. I have not heard any value in upsampling myself. If the song does not come at 44K, I play it back from one system at the original sample rate and recapture it at 44K after my analog chain on a different system. For mixing, I use 88k for low track counts (under 30) and 44K for everything else. 192 is not practical and brings not sonic benefit that justify the associated pain in my opinion. @edouarddarracq: it was have been similar. Probably not the same. Hi Fab, Really nice tutorial. If you have chosen the bax eq from UAD would have been the same tone as the hardware? Hi Fab Excelent again. So now it's shipped to the Vinylplant who slam it with a 50-60 Hz LPF... :) Ain't it wonderful fullrange times, which render all pre 90's reference tracks semi useless. It's a great video and the points made are timeless, thanks. Dear Lord... just what I needed. Thanks Fab!